Boulder, Colo. – July 20, 2015 – JumpCloud®, the first Directory-as-a-Service® company, today announced the integration of G Suite™ into its cloud-based directory, enabling the more than 5 million organizations currently utilizing G Suite to easily and securely control and manage connections between users and their devices, applications, and networks. Traditionally, G Suite has not functioned as a directory service, forcing IT administrators to either manually manage access control or utilize on-premises software such as Microsoft’s Active Directory® (AD). JumpCloud’s Directory-as-a-Service (DaaS) simplifies reusing an employee’s Google credentials to access corporate IT resources, eliminating the need to manage multiple versions of a user’s identity. As it is, many IT administrators struggle to extend their user identities to the rest of their IT infrastructure. With JumpCloud, employees can now use a G Suite username and password to log in to their company’s WiFi networks, applications, servers, and computer desktops (Windows®, Mac®, and Linux). Through a simple import, JumpCloud seamlessly centralizes and merges G Suite user accounts under a single, cloud-based directory that requires no additional hardware or software, eliminating the need for on-premises infrastructure. This simplifies IT maintenance and management while dramatically increasing security and control. JumpCloud’s G Suite integration allows IT admins to avoid storing users in multiple locations or within other on-premises identity and access management (IAM) infrastructure, such as Microsoft’s Active Directory or LDAP. 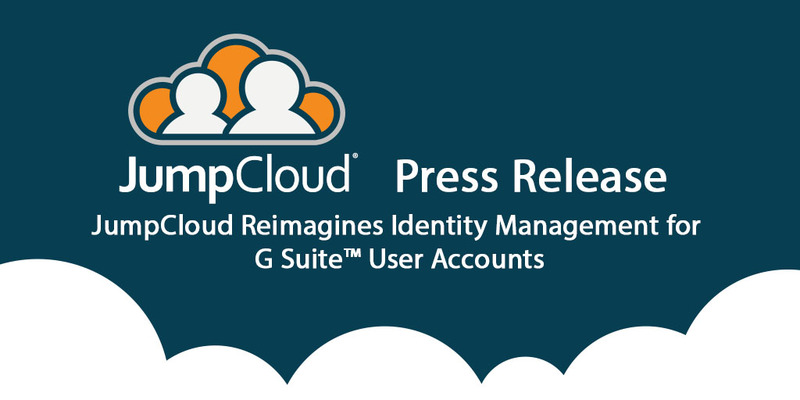 JumpCloud leverages the cloud to store one username and password – a true single identity leveraged across the entire organization. JumpCloud’s G Suite User Provisioning and Sync utility is now available. Try JumpCloud’s cloud-based directory with ten users free forever at jumpcloud.com.